You are here: Inicio » Solar Thermal News & Events » What is the Resale Value of My Solar Home? FOR IMMEDIATE RELEASE – Does the solar system installed in your home increases the property value and helps you when selling your home? Yes! The American Appraisal Institute estimated that any home features that save in operating costs would increase the home’s value by twenty times the amount saved. Every homeowners who have installed solar systems in their property experience an increase in resale price of the home generated from the systems they have installed. The question now is,” How much will my property value increase from installing a solar system?” It really depends on your system. The more your system is able cut in operating cost, the higher the value increase will be. Considering the energy savings once the system is installed, the initial cost is always recaptured when the home sells. According to recent studies, solar thermal systems save more energy than PV Systems, which translates to solar thermal systems can increase your home value more than PV Systems. Ed Gunn from SunMaxx Solar, one of the leading solar companies in the solar thermal industry, acknowledged that solar thermal systems can add up to $20,000 in property value to your home. Examples of such solar thermal systems are offered by SunMaxx Solar Inc., featuring some of the most efficient solar thermal systems in the entire industry. 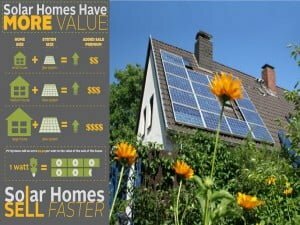 One of the many reasons to go solar, despite the fact that it is a home improvement that will pay for itself, is that the initial cost invested will recuperate with value added to the home.